THE HAGUE–Someone who connects people, who makes everyone feel appreciated, who fights against injustice, breaks taboos and says things in a candid manner. There was only praise at Friday’s farewell reception for Chairman of the Consultative Body for Dutch Caribbean persons in the Netherlands Ocan Glenn Helberg. Helberg led the Ocan for eight years with a great passion and a deep commitment and this didn’t go unnoticed judging from the tributes that he received from the long list of speakers at the well-attended reception that took place at the Curaçao House in The Hague. Referring to Helberg, a psychiatrist by profession, as an exemplary person for the Dutch Caribbean community, Curaçao Minister Plenipotentiary Eunice Eisden said his work at Ocan was highly valuable. Ocan’s input has always been important and remains necessary, she said. Eisden mentioned one of Helberg’s major undertakings, the Change the Mindset report which addressed the structural causes for the problems with Dutch Caribbean high-risk youngsters. The line of thinking of this report which was drafted with the help of experts from the islands was that poverty can be tackled if people change their mindset, if youngsters are being raised in a positive manner and learn to appreciate themselves. The Minister Plenipotentiary said that the message of the Change the Mindset report was still a current theme and that as such it deserved continued attention. Former Ocan Chairman Roy Pieters said Helberg continued this process, dedicating more attention to emancipation and by highlighting the positive aspects, the role models of the Dutch Caribbean community. Director of Kingdom Relations of the Dutch Ministry of Home Affairs and Kingdom Relations Erwin Arkenbout said he gave Helberg a “high five” for the solid cooperation with his ministry. “But I have yet more appreciation for your openness, your honesty and candidness. You always said what you meant and meant what you said,” he said. Ocan Director Marnix Arendshorst looked back at the input that Helberg had in making the Ocan a major and appreciated professional organisation for the Dutch Caribbean community. He mentioned the national Stop the Violence march, the court case against the Referral Index for Dutch Caribbean persons, the VIA and the participation in two gay pride canal parades. He said that community building was always one of Helberg’s top priorities, as was the fight for black and white consciousness. Chairperson of the Antillean Network Association VAN Roos Leerdam-Bulo said Helberg had the ability to listen to people as a father, always fought injustice, openly talked about taboos and worked hard to erase the negative image of Dutch Caribbean youngsters in the Netherlands. “You are an inspiration to others,” she said. Elvis Manuela of the Multi-ethnic Cultural Network of the Dutch Defence said Helberg broke taboos and made fathers and mothers aware of their role. 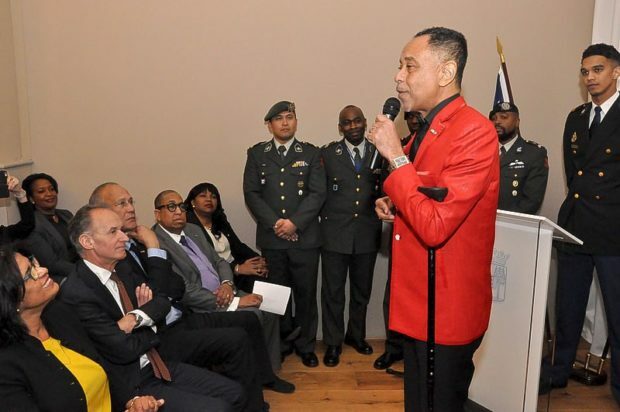 “You brought up homosexuality for discussion, a taboo that we didn’t openly discuss.” A total of 18 members of the Police Force and Defence of Dutch Caribbean descent attended Friday’s reception. Besides the open talk about homosexuality, there were three other main points that struck Ocan’s new Chairman John Leerdam about Helberg: the launching of the Dutch Caribbean Pearls Awards to put role models in the spotlight, the importance of the role of the father in parenting and the emancipation and anti-racism battle. Leerdam said there were three new challenges to deal with: the elections this year in the Netherlands, Curaçao and Aruba and the effects on the relations in the Kingdom, the continued migration to the Netherlands from the islands due to poverty and the decision of the Dutch Government to cease the minority group policy. Helberg directly addressed Minister Plenipotentiary Eisden who will soon have to leave if an interim cabinet materialises in Curaçao. Helberg said that he was thankful that she hosted the reception. He said that he had never seen the inside of the new Curaçao House, because the previous Minister Plenipotentiary Marvelyne Wiels never allowed Ocan in. “She shut us out. She didn’t think that there was a place for us here. Shutting people out is never right and this should never happen again,” said Helberg, who did add that his cooperation with the St. Maarten House had been very good and that he always felt welcome there. St. Maarten Minister Plenipotentiary Henrietta Doran-York attended Friday’s reception. Several speakers wished Helberg much luck in his upcoming endeavour as candidate number 18 on the slate of the Article 1 party in the March 15 Dutch Parliamentary elections. “You are entering politics in a very difficult time. It is not only a mess over there, but also here,” said Roy Pieters, referring to the political atmosphere on the islands and in the Netherlands.